Given my love of art and architecture, it made sense that my first post be about architecture. The intersection or divide between art and architecture can sometimes be blurry. I consider architecture a form of art with functionality. 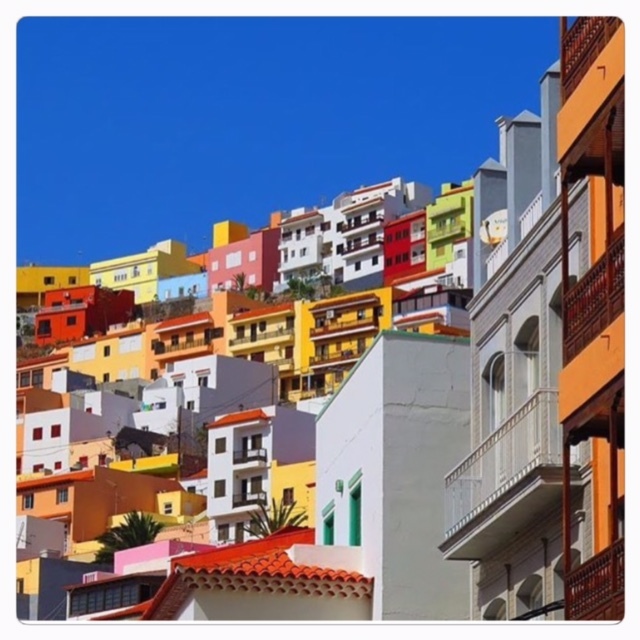 This photo was taken during a trip to San Sebastian, the capital of La Gomera Island, in the Canary Islands, prior to my formal graduate studies in contemporary art and design. The pictured hillside residences overlook the town’s square and have ocean views. The colours and stadium placement of these residences reminds me of an inviting festival. While visiting San Sebastian, I found this joyful and inviting architecture to have an uplifting effect on my mood. It’s amazing how colour, form, and one’s environment can have such a profound impact.